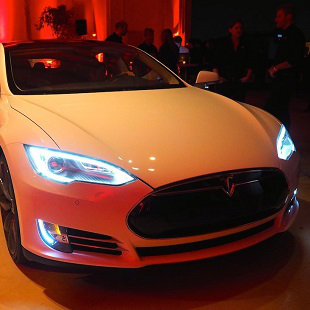 The updated Model S has two electric motors, and limited self-driving capabilities. Update 2: An official update to our Tesla D rumor story from last week: Tesla has taken the wraps off of a revamped Model S lineup. There are new "D" models -- P85D, 85D, and 60D -- and each is all-wheel drive. The top-shelf P85D has two electric motors on board. The 0-60 time of the new models is just over three seconds, and the driving range will be an additional 10 miles on all three models, according to Tesla. Along with AWD, the new models also have some self-driving features built-in. When a Model S-D driver signals for a lane change, the car will now shift lanes on its own, while keeping an eye behind and in front of itself in the process. The car's cameras and other sensors will also be able to scan for road signs, and incorporate that data into lane-changing. Other driving assist features include self-adjusting cruise control, and lane-drift assist. Update: One interesting theory worth shining the spotlight on: Elon Musk has talked about an all-wheel drive (AWD) version of the Model S in the past. The Model D could represent this AWD sedan (which would likely contain some other improvements), to go along with the upcoming AWD Model X. Alternatively, if the Model D is a wholly new vehicle, the "something else" referenced by Musk in the same tweet could be the AWD update. Tesla is in direct competition with other, larger luxury brands, most of which offer AWD on all or most of their vehicles. Audi is an all-AWD brand, while BMW and Merc both offer AWD versions of their sedans. Original Story: Tesla Motors will reveal its next automobile to the world on October 9th, according to founder and CEO Elon Musk. When he's not busy running SpaceX, or talking about putting one million men and women on Mars within the century, Musk keeps busy running Tesla Motors, makers of the Model S sedan, and the forthcoming Model X crossover. But it's seemingly time for a third Tesla Model car (fourth if you count the discontinued, Lotus-based Roadster), and Tesla will use the Paris Motor Show as its springboard. Musk's tweet is to the right, where he teases the Model D, and "something else." There's no mention of the Model D on the Tesla Motors website just yet, and the "something else," is probably not yet another car. My sort-of-educated guess? It could be an addition of some sort to Tesla's Supercharger network, like an expansion of the free charging system outside of the United States. But for all I know, Musk could be promising every Model D buyer a trip to Mars. The Model D, unknown aside from the headlights viewable in Musk's tweeted photo, could be the low-cost Tesla car we've heard about in the past, re-branded with a new name. The Paris Motor Show takes place in the aforementioned city October 2-19, so expect plenty of cool car news to surface in the coming weeks. Volkswagen has shown off a slick new XL Sport coupe, while Lamborghini took the wraps off its 910 HP plug-in hybrid.